One of the oldest debunking sites on the Internet, Snopes.com focuses on urban legends, news stories and memes. They also cite their sources at the end of each debunking. Check credentials - Is the author specialized in the field that the article is concerned with? Does s/he currently work in that field? Check LinkedIn or do a quick Google search to see if the author can speak about he subject with authority and accuracy. Read the “About Us” section - Does the resource have one? It may be on a tab at the top of the page, or a link at the bottom of the page, but all reputable websites will have some type of About Us section and will provide a way for you to contact them. Look for bias - Does the article seem to lean toward a particular point of view? Does it link to sites, files, or images that seem to skew left or right? Biased articles may not be giving you the whole story. Check the dates - Like eggs and milk, information can have an expiration date. In many cases, use the most up-to-date information you can find. Check out the source - When an article cites sources, it's good to check them out. Sometimes, official-sounding associations are really biased think tanks or represent only a fringe view of a large group of people. If you can't find sources, read as much about the topic as you can to get a feel for what's already out there and decide for your self if the article is accurate or not. Interrogate urls - We see quite a bit of domain manipulation these days. For instance, what looks like an .edu domain, followed by .co or “lo” is likely a fake or deceptive site. If you are you seeing a slightly variant version of a well-known URL, do a little investigating. 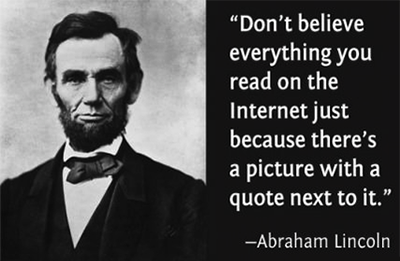 Suspect the sensational - When you see something posted that looks sensational, it is even more important to be skeptical. Exaggerated and provocative headlines with excessive use of capital letters or emotional language are serious red flags. Judge hard - If what you're reading seems too good to be true, or too weird, or too reactionary, it probably is. 1. When you open up a news article in your browser, open a second, empty tab. Use that second window to look up claims, author credentials and organizations that you come across in the article. 2. Check your own search attitude and biases: Is your search language biased in any way? Are you paying more attention to the information that confirms your own beliefs and ignoring evidence that does not? 3. Fake news spans across all kinds of media - printed and online articles, podcasts, YouTube videos, radio shows, even still images. 4. As Mad-Eye Moody said in Harry Potter and the Goblet of Fire, "Constant Vigilance!" Always be ready to fact check. 5. Be suspicious of pictures! : Not all photographs tell truth or unfiltered truth. Images are normally edited or process, but sometimes they are digitally manipulated. Some are born digital. A Google reverse image search can help discover the source of an image and its possible variations. 6. Even the best researchers will be fooled once in a while. If you find yourself fooled by a fake news story, use your experience as a learning tool.